Buying wine abroad is a blast, but you have to know where to look. Many travelers blow their money in airport duty-free shops on a bottle of something that could most likely be purchased for about the same price at the liquor store down the street from where they live. 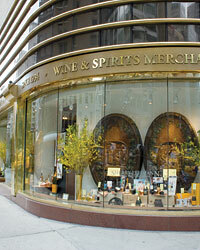 A better strategy is to visit some of the top international wine shops. While prices may not be any lower than in the U.S., it's almost guaranteed that some of the most interesting bottles simply won't be available here. And they're also a great source for last-minute gifts. One of the distinct pleasures of wine shopping at Berry Bros. & Rudd is simply knowing that the store has been in business at the same address in London since 1698, when it was founded by the widow Bourne, originally as a coffee-and-tea emporiumnot something many, if any, other wine shops can claim. Another appealing aspect is the knowledge that there are around 20,000 bottles of wine in the vaulted cellars below the shop, enough variety to satisfy pretty much any wine collector in the world. 3 St. James's St., London; 011-44-870-900-4300; bbr.com. Lavinia claims to be the one of the largest wine stores in Europe, with more than 6,000 wines on its shelves. The shop's three climate-controlled floors feature wines from France (of course) as well as pretty much every other wine region in the world. It has a temperature-controlled storage area for "natural" wines made without added sulfites (which are easily damaged by shifts in temperature), a bar/restaurant where any wine in the store may be purchased and drunk for its retail price, and a vast selection of rare Cognacs and Armagnacs. 3 Blvd. de la Madeleine, Paris; 011-33-1-42-97-20-20; lavinia.fr. Free Saturday tastings are just part of the appeal of this Sydney wine shop, generally agreed to be one of the finest in Australia. The selection of 2,000 wines typically includes a number of Australian rarities that aren't imported to the U.S., like cult producer Wendouree's potent Cabernet Malbec or older vintages of Lindemans's famed Hunter Valley Semillon. Shop c21/99 Jones St., Ultimo, Australia; 011-61-2-9211-2380; ultimowinecentre.com.au.